Hardback bound documents for use as manuals, books etc. Great prices and rapid service for whatever quantity you need. You can choose black & white printing, full colour printing, or a mixture of both. The hardback covers for these books are custom printed with your own artwork, or you can choose a variety of material covers with optional hot foil printing. You can see a a materials swatch by clicking here. PLEASE NOTE: these are the book block sizes, the cases (cover) are slightly larger. See the artwork preparation guide for more details. We can also do custom sizes where technically possible, but these will cost a little more. Have a chat with the helpdesk on 01452 751900 to discuss. Custom full colour print. These are printed cases with a layer of protective laminate on the top. The cases are custom printed with your own artwork, or we can design your cover for you (extra charges apply). Material / Cloth. We can custom manufacture cases with various different types of finish. For more help about this, select this option and then click on the information button next to the "Cover material" option. Material and Cloth covers. We can custom manufacture cases with various different types of finish. There are a wide variety of other materials that range from the beautiful and unusual to the frankly outlandish! If you have a interesting project then please get in touch with the helpdesk and we can discuss options. We love making beautiful things, but bear in mind that these are custom made hardback books using high quality materials specially ordered in to your requirements. We're happy to also send you samples, but you will need to speak to the helpdesk on 01452 751900 so that you can discuss what samples you need. In this help section, we refer to "digital" and "traditional" hot foil printing. You can learn about the differences between these processes in the relevant help section, but in this section we explain which materials are suitable for which process. We buy most of our stock materials directly from FiberMark Red Bridge in the UK. The UK has a long history of manufacturing high quality book binding materials and the Fibremark Red Bridge manufacturing plant in Bolton exports over 80% of their production. Over the years, members of Inky's team have visited other book printers and binderies across Europe and interestingly what we call "Library Buckram" here in the UK is sometimes just called "English Buckram" overseas. 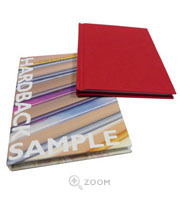 Although we stock thousands of kilometers of book cloth and embossed cover paper, there is a lot more available! So, if you have something different in mind, please have a chat with the helpdesk, who can talk you through what is possible. Please bear in mind that it can be expensive to order in a special material for a short run of books, so that may limit what is practical. For some combinations of colours and material, we have to order in a minimum quantity of many thousands of square meters. Thankfully there are many other options where we can obtain smaller quantities! Buckram. 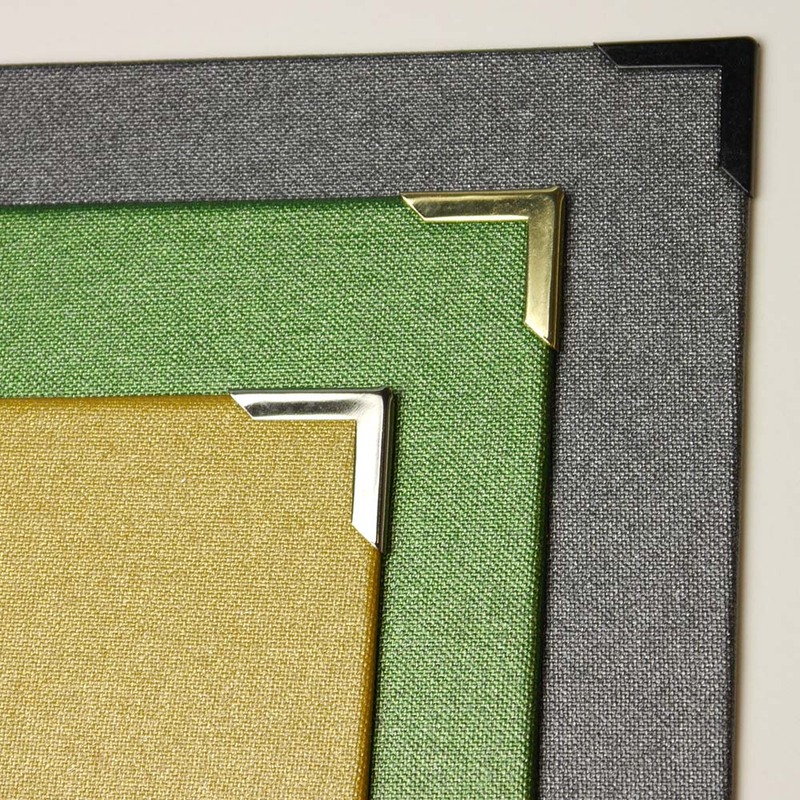 We stock Arbelave Library Buckram in a wide range of colours, including metallic. Some people call the metallic colours "sparkle" colours for the obvious reason. Library Buckram is one of our most popular materials, but make no mistake, this is the highest possible quality that you can buy. Library Buckram book cloth is a cotton cloth with an acrylic coating, giving the surface a soft lustre. This is a durable and high quality water resistant cover material. Wipe clean with a damp cloth. This material can be hot foil printed both digitally and traditionally. The drop down menu on this page will display our stock colours. We can order in many more colours in this range. Book cloth. We stock Cialux, which is a tissue lined Viscose Rayon book cloth with a fine weave. This is a durable, high quality uncoated cloth that is also used for luxury packaging. This is a flat matt cloth finish. It is not wipe clean and cannot be digitally hot foil printed. Hot foil only with traditional brass dies. Linen. We stock only heavy Crash Linen, which is a heavy duty book cloth with a coarse weave. Not water resistant or wipe clean. Cannot be digitally hot foil printed, hot foil only with deep etch brass dies. Embossed, strengthened paper. We stock Acrolin, an embossed, acrylic coated latex impregnated strengthened paper. We stock a wide range of colours in the Pampilona 29 pattern. If that all sounds like gibberish, fear not, that is book binding techno jargon, but relatively easy to explain. Here we go. Find your passport. Take a look at the cover. That's Acrolin, embossed with a Pampilona 29 pattern. You didn't really think that was real leather did you? Of course, I'm writing this in 2017 and all of us in the EU have pretty much the same lovely passports. We may have to rethink this explanation post Brexit! Pampilona 29 is a fine leather (SEE NOTE 1) embossed texture and it's the one we stock in a variety of colours. It is a durable and high quality water resistant cover material. Wipe clean with a damp cloth. This material can be hot foil printed both digitally and traditionally. The drop down menu on this page will display our stock colours. We can order in many more colours in this range. Acrolin is also available in a linen pattern, heavy leather texture, lizard skin pattern and others! Are you interested in a leather bound book? In general there are varying degrees of what might be loosely called "leather" when binding books. At the very top, you have genuine leather. High quality book leather is typically made from goatskin or sheepskin. The production of this leather alone is a highly skilled and vanishingly rare craft. When you come to the production of the book cases, that really can only be described as an art form combining leather working and book binding skills. Imagine someone custom making a fine leather handbag for you, then hand decorating it with embossing and gold foil. Making your leather book case (AKA the cover) is a lot more complicated than that! Sadly, these types of books are rarely made anymore as they are just too expensive for most projects. If this is what you want, then we salute you and recommend our friends at the Ludlow Book Binders. They are one of the last bastions of traditional British hand book binding. We would be happy to print the book blocks for you on our shiny state of the art digital presses though, as they don't do that bit. Somewhere around the middle you have Bonded Leather. This is largely made up from genuine leather fibres, so that it looks, smells and feels quite a lot like genuine leather. It is available embossed with a variety of leather patterns. This material is still expensive, but expensive like a BMW, not expensive like a Rolls Royce. As it is a manufactured product, it can be used with modern case making machinery by skilled book binders. This makes it a product that modern book makers like us here at Inky can manufacture. 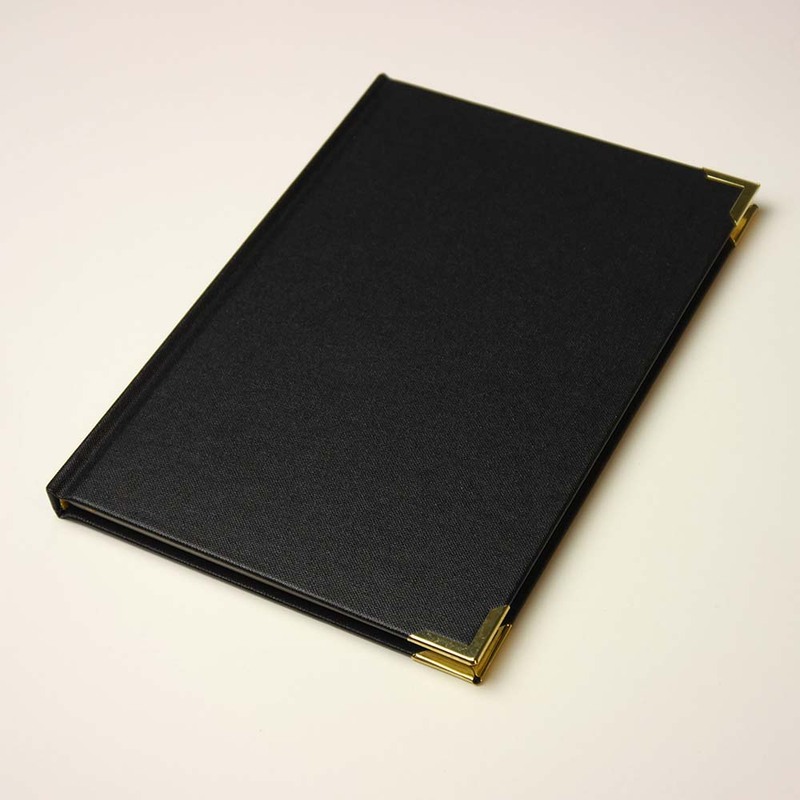 As you can imagine, there are still wide variations in the quality of bonded leather available, but a reputable UK book binder will use good quality genuine bonded leather. If you are interested in this, speak to the helpdesk and we can discuss the options with you. Incidentally, bonded leather like this is generally a lot higher quality than most of the "leather" goods you will see in the shops (yes, I am talking about sofas). Sitting slightly below the bonded leather is leathercloth. To a casual observer, this does look and feel like genuine leather and can be a high quality product in it's own right. A good quality version will also stand up to many years of use. It isn't leather though, so will not smell like leather or pass an informed inspection. Again, speak to us if you are interested in this product. Below that comes a coated paper with an embossed leather pattern. Almost all "leather" bound books you see in the shops are in fact, this. There is generally a acrylic/PVC type coating to the paper and this gives the paper a dull shine and some protection from wear. If material from a quality manufacturer is chosen, this is a good quality product in it's own right. It will not smell like leather or last like leather. It does look quite a lot like leather though! We stock a wide range of colours in a high quality version of this product - Acrolin pattern Pampilona 29. You can choose from either a gloss, matt or soft touch protective laminate. This type of book cover must have a protective laminate. Soft touch laminate is a matt laminate, but with a tactile soft finish. This is a very fashionable and doesn't mark as easily as matt laminate. A dust jacket is a loose detatchable outer cover for your hardback book and is optional. It is printed one side on lightweight paper. You can choose from a silk or gloss coated paper. Please remember that this is not the same paper you buy for your inkjet at home. Gloss does not mean a very high gloss level, it has a gloss sheen. Silk is a matt finish with a slight sheen. You can ask the helpdesk for samples if you are not sure whether this is what you want. Laminating is not currently available on this product, but is technically possible for larger quantities. Please call the helpdesk for a chat to discuss lamination or any other options that are not shown here. Please refer to the artwork preparation guide for this product before submitting your artwork. We are happy to send out samples of our printing for you see before you order. Please call the helpdesk to discuss your requirements. All B&W (Standard quality). Standard quality black & white is printed on the latest generation Xerox Nuvera EA digital production printers at 4800x600dpi. The quality is excellent for this type of machine, giving crisp text and graphics and reasonable quality photographs at 150lpi. Do not attempt to print more than about 20-30% coverage with this type of print, it is not designed for it and will not give perfect results. Examples of this are solid black pages with reversed out writing. All B&W (High quality). High quality black and white is printed in black & white on a colour digital press for near photographic quality. These presses are used for photobook printing and you should choose this option if that is the type of finish you wish to achieve. This is high quality commercial printing, not a contone photographic process. A mixture of Colour and High Quality B&W. If you require some colour pages and some black and white pages, choose this option. Your book will be printed on a colour digital press. It is not possible to mix "standard" black & white and colour in the same book. Colour. Full colour printed on a colour digital press for near photographic reproduction. These presses are used for photobook printing and you should choose this option if that is the type of finish you wish to achieve. This is high quality commercial printing, not a contone photographic process. Number of black & white pages. Please note that this is pages, not sheets. For example: a book with 100 sheets of paper inside (leaves) is a 200 page book. If you have any blank pages, for example before the start of a chapter, you must count the blank page as a black & white page. This is the paper that your book block (the pages of your book) will be printed on. We are happy to send out paper samples for you see before you order. Please call the helpdesk to discuss your requirements. All of our paper options are high quality and suitable for both colour and black & white printing. Cream book wove. This is genuine Munken Print Cream 15 from Arctic Paper in Sweden. It is a very high quality cream shaded paper developed specifically for book printing. Gloss paper. Triple coated gloss paper. This is a gloss paper similar to the ones that you see in magazines and illustrated "coffee table" books. This is a commercial printing paper, it is not the same as the high gloss paper you may use for photographs in your inkjet printer. If you need an alternative paper, please call the helpdesk for a chat to discuss options. All non-recycled paper is good quality branded paper that uses ECF pulp from sustainable and well managed farmed timber. The recycled paper option is made from 100% Post Consumer Waste. We're sometimes asked about whether you can write easily on these papers. You can write easily on all types with a standard ball point pen. If you want to be able to write with a fountain pen, then we recommend sticking to the matt uncoated paper. If you want a hard copy proof, please just order a single book. These are working days to print. Our standard print service is 5 working days to print. You can pay a premium if you want your order on the faster 2 day to print service. You must upload your files as PDFs. We can hot foil print onto any book case (cover). It is REALLY important that you read the artwork preparation guide to understand how this works, how to send us your artwork and where you can print. For example, we cannot print right up to the edge of the case. We offer two different types of hot foiling. Digital hot foiling is a new process and is ideal for very small quantities of books. It is more limited in what you can achieve, what you can foil onto and the colours of foil that you can choose. We do not recommend digital foiling for large solid areas, or very complex designs. Traditional hot foiling (and embossing) is done using our Kluge EHD press. This is a 2.5 tonne beast that requires skilful setup and uses engraved copper or brass dies. This is more expensive to initially set up, but produces superb results that are deeply impressed into the book cover in a way that just cannot be matched any other way. There are more colours available and we can foil on any of the materials that we offer. We use top quality Kurz foils in various grades. Because traditional hot foiling uses engraved dies, we cannot combine this and our express (2 day) print service. If you are working to a very tight deadline, have a chat with the helpdesk to discuss. Please bear in mind the following advice for TRADITIONAL foiling. Library Buckram. Excellent results are normally achievable. Gold and Silver foil will give you the best results if you have large solid areas of print. Colours can "pick" slightly on large solid areas, leaving tiny pin holes in the foil. Normally these are minor and do not detract from the image. Book Cloth. Good results are normally achievable. Gold and silver will give you the best results, but colours can give pleasing results. Bear in mind this is woven CLOTH, so writing and small simple graphics look great. It is possible to foil large solid areas and get pleasing results, but you will not get a uniform flat foiled surface, the texture will always show and you will always see flecks of the underlying colour. Leather Pattern material. Excellent results are normally achievable. Gold and Silver foil will give you the best results if you have large solid areas of print. Colours can "pick" on large solid areas, leaving pin holes in the foil. Normally these are minor and do not detract from the image. Linen. Please bear in mind that this is heavy textured linen. Not a "linen effect", or a "linen emboss" or anything even remotely similar. This means that text looks great, and small simple graphics can look pleasing, but we do not recommend any solid areas. Gold and Silver foil will give you the best results or our Kurz "Colorit" foils (please speak to the helpdesk for guidance). Colour printed & laminated covers. Excellent results are normally achievable. Gold and Silver foil will give you the best results if you have large solid areas of print. Colours can "pick" slightly on large solid areas, leaving pin holes in the foil. Normally these are minor and do not detract from the image. Please also remember that A4 landscape books are challenging to hot foil print and you CANNOT digitally print on an A4 spine of less than 10mm at the very minimum. You are welcome to phone the helpdesk and ask for some foiled samples. Hot foiling can be quite an expensive process. So, if you only need a small area, we will only charge for that small area. There are therefore two options available to you. The small area is ONE section that can go the entire width of the cover (less 5mm from each edge) and a maximum of 50mm high. The full coverage allows you to print anywhere on the front cover (less 5mm from all edges). Please read the artwork preparation guide for more details. If you are not clear on anything after reading the artwork preparation guide, please have a chat with the helpdesk on 01452 751900. When hot foiling spines, it is best to be realistic! Very thin spines are extremely difficult to print on and we recommend a spine of at least 10mm for best results. You can print the entire length of the spine, less 5mm from the top and bottom and 2-3mm from the other edges. Ribbons are used to mark your place in a book. These are the standard colours that we keep in stock. We can special order in just about any colour that you want, however there is a stocking charge for this. We can also add multiple ribbons per book. If you'd like to discuss either of these options, please call the helpdesk on 01452 751900. 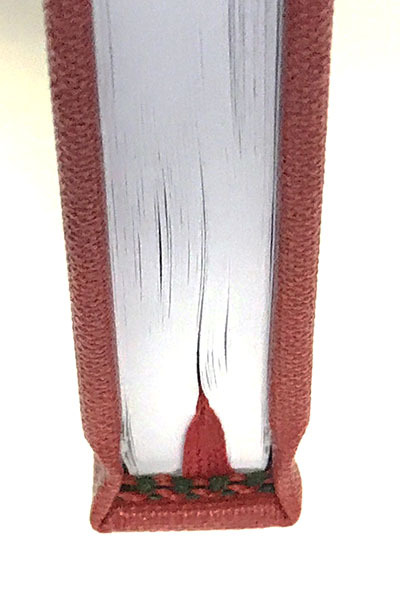 Headbands are a decoration at the top and bottom of the spine of your book. They are coloured or multicoloured ribbons that nicely finish a high quality hardback book. A picture follows to help. We can offer different coloured headbands, but there is a stocking charge for this. If you'd like to discuss this option, please call the helpdesk on 01452 751900. Spine and hinge reinforcement. For books that are likely to be heavily used, or experience rough handling, this adds an extra level of strength. Continuous end papers and fly sheets. With our standard binding, these are separate sheets that are glued together. If you are being very particular, continous sheets look a little nicer. Coloured end papers and fly sheets. When you select Premium binding, this option becomes available. Coloured end papers and fly sheets are not available with standard hardback binding. Printed end papers and fly sheets. By default, all end papers and fly sheets are blank. If you select Premium binding, you are able to select the option of printing on your end sheets and fly papers. Please see the artwork preparation guide for an explanation of any terms that you do not understand. Premium binding gives you more options. If you need help, or samples, please call the helpdesk to discuss. Except for the two options that match your end papers and fly sheets to your book block, all the other options are matt uncoated paper. Matched to book block (BLANK). With this option, where technically possible, we match the type of paper used for your end sheet and fly paper to the paper used for the book block. For instance, if you have selected 170gsm silk paper for your book block, your end paper and fly sheet will also be 170gsm silk. Matched to book block (PRINTED). With this option, we match the paper to your book block, plus you can supply artwork to us to print on the end papers and both sides of the fly sheets. There are lots of other things that are POSSIBLE. For instance we could hot foil or even die cut your fly sheet. You need to speak to us if you want an option that's not available here and we can discuss what's possible. Digital foiling is currently available in (shiny) Gold colour and (shiny) Silver. If you need a different colour, check out the traditional foiling option. This item lists all of the foil colours that we currently stock. Make sure that you also read the help for "Hot foil cover", as this includes important information about what can be achieved. It is possible for us to special order in different colour foils. This is not a cheap option, but may be worth while if you want a specific colour. I'm not going to mollycoddle you, this is a difficult bit to get your head around. We recommend that if you haven't done this before, you have a chat with the helpdesk and they will calculate the size of your die with you. If you'd like to calculate the size of your die yourself, read on. Here are a few additional items to remember before starting. Dies are calculated in square inches. That's just the way it is. Under all circumstances, we will recalculate your die size and adjust the price accordingly if necessary. A die is a physical object, a rectangular engraved slab of metal. If you have two small areas to foil, the size of the die must cover both areas and all of the area in between. If you plan to reprint your book, We MAY be able to keep your die for you and re-use it. We do not guarantee this and you will need to ask us to keep the die! If you reprint a book using the same die, there will be a modest cost saving. The bigger the die, the more expensive it is and the more incentive to try and re-use it. We cannot send you your die and we cannot accept a die made elsewhere. Measure the size of your artwork in the X-axis in inches. Add 0.5 inch to this dimension. Round UP to the nearest half inch. Measure the size of your artwork in the Y-axis in inches. Add 0.5 inch to this dimension. Round UP to the nearest half inch. Multiply the two dimensions together, this is your die size. If you get stuck, call 01452 751900, we are always happy to help with your order. Remember - you may have to scroll down to see all the page contents! Choose the options that you want using by filling in the "Instant Quote" form. If you don't understand any of the options, click on the big "i" ("information") icon next to the option. This will display help and further information about that option. Once you have set the options you need, click on the "Calculate Price" button. Your price and a complete summary of the options you have chosen are displayed in the "Quote" area. You can change the options and do this as many times as you need. Once you are happy with your quote, you are ready to add that item to your basket. To add an item to your basket, click on the buy button. This adds the right quantity, with all the right options to your basket. You can add more items, delete items, or completely empty your basket as required. When one or more products are in your basket, you can order them by clicking on the place order button. You must be registered and logged in before you can place an order. Don't worry if you are not already registered or logged in, your basket will be kept safe while you do this. You can register by clicking on the Register button at the top of the page or by selecting this option from the main menu. The Registration process takes only a couple of minutes. There is a video tutorial in the HELP > TUTORIALS section to help if you get stuck. Use the main menu to find this, or click here to go straight there (this link moves you to a a new page). Just click on the "i" (information) icon right next to the question. You need to submit two PDFs, one for the cover and one for the book block (inner pages). Please read the artwork preparation guide before placing your order. These prices are just for the printing, but we can design the cover for you as well. Please have a chat with the helpdesk and we will work out a price for you. Take a look at the menu on the left hand side (or the home page for a list) and that will tell you what our "standard" products are. If what you want isn't there, just give the helpdesk a ring. We'll let you know if we can do it, and give you a quote. How do I find out what all the options mean? I'd like to talk to someone about this, what number do I dial? What format can I send my artwork to you in? How do I place my order? I want my cover designed for me, how do I arrange that? I want something that's not on this page, can you help? My question wasn't answered in these FAQs, what should I do? These hardback books need a minimum of around 40 pages to be able to bind well, the process does not work well for very thin books. We can only print from an electronic original, this is not a photocopying service. We normally expect your file to be in PDF format. If you don't have PDF generation software, then a very popular and free version is available at www.cutepdf.com. Please see the artwork preparation guide (link above) for detailed help. Need a different type of binding?